Humans are a stupid sort of sadomasochistic species. We watch slasher flicks, knowing that it’s going to leave us paranoically terrified. We drink too much only to wake up the next morning feeling like a hungover mess. And in the case specific to this review, we plough through especially spicy dishes, fully aware that it can only lead to blood (well, maybe not blood), sweat and a whole lodda’ tears. At a certain point though, we have to ask ourselves: is any of this really worth it? 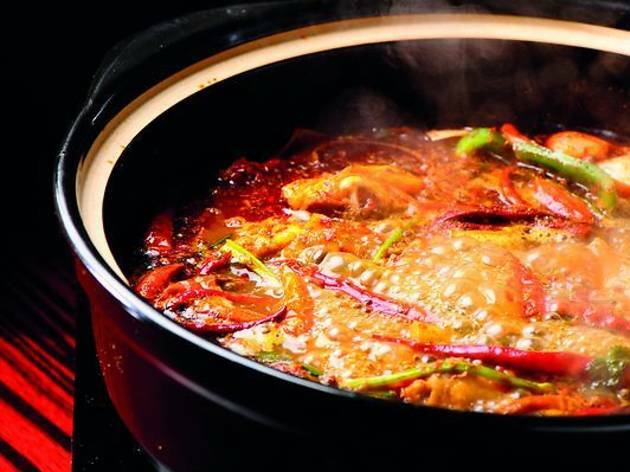 Enter As You Like – a Jordan joint specialising in Sichuan-style hotpot. The restaurant is essentially a hollowed out room; the only form of décor adorning the white-washed walls is a TV perpetually tuned into Cantonese drama series. 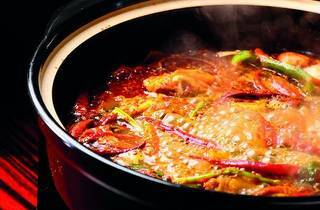 The name refers to the customisable nature of the menu, starting with the signature hotpot broth which ranges from non-spicy, low-level, medium, to full-on fieriness. We opted for a compromise and ordered the half chicken yin yang hotpot ($73) with regular broth on one side and the medium spicy Sichuan variation on the other. Within minutes, the hotpot from hell arrived at our fold-up table, blessed with more than 20 different Chinese herbs and spices (dried chillies, Sichuan peppercorn, dong quai, star anise) and a thick blanket of chilli oil floating on the surface. According to the staff, the myriad seasonings are stir-fried for hours to form a thick, rich-red paste. The paste is left overnight to allow the flavours to fully develop and then mixed into chicken broth to form the spicy concoction which the staff proudly refer to as the soul of the menu. We ticked off a feast of raw dishes from the menu to dunk into the broths. Most items come in two sizes, again allowing the customers more flexibility with their orders. While the menu may not be the most extensive, all the items have been specially selected to pair well with the Sichuan broth. There are only a few seafood items on offer since the chefs believe the freshness would be wasted in the numbing spiciness. Instead, they recommend boiling away thin slices of fat-marbled US beef ($98) or gamey Mongolian mutton ($63). We also ordered a round of billowy soft fish tofu ($30/$11), which soaked up the spices like a well-seasoned sponge, and delicious ping pong-sized beef balls and hand-pounded cuttlefish balls that bobbed about on the chilli-studded surface (both $30/$11). Vegetarian items turned out to be the surprise favourites of the meal. We grew dangerously addicted to the fresh silken beancurd sheets ($22/$8) which hid explosive pods of Sichuan peppercorns in its folds. And even though the broth was already setting our head, shoulders, knees and toes on fire, we couldn’t stop slurping down the restaurant’s signature potato noodles ($18). These thick, glossy strands slipped and slid between our chopsticks, saturated in all the broth’s peppery flavours to leave a painfully tingling yet tantalising taste on our tongues. But was this experience worth the numbed taste buds, the clenched fists, and the sweat-inducing pain? Call it playing with fire, but with As You Like’s stellar Sichuan hotpot we’d gladly relive the experience all over again. G/F, Man Wah Building, 2 Man Wui St, Jordan, 6716 4788 & 9045 3368. Daily 6pm-3am. Meal for two: around $400.